Are we seeing evidence that Quebecers are awakening and noticing that the mainstream political parties are barely indistinguishable from each other? Some observers say that the political machine remains stable and only the driver gets changed at election time, whether it be for a municipal, provincial or federal election. And we-the-people are tricked into thinking that we have deomocracy and that our vote counts. Indeed, it may be the right time to send some career politicians to the political graveyard. In any case, six disenchanted Quebecers with some previous experience in various political parties recently launched the Quebec Freedom Network to capture the essence of what is really going on in the minds of the awakening Quebecers. The French translation is: Le Réseau Liberté-Québec (RLQ) At this time, the website only offers the French language. Hopefully, there will be an English translation in the not-too-distant future. On September 14, 2010, The National Post published an article authored by Roy Eappen explaining the goals of the movement. The article was titled “Don’t Call It A Tea Party’ and it was on page A12. According to the article the goal of the Quebec Freedom Network is to communicate with fellow-citizens and influence political parties to work at dismantling the massive nanny state. Roy Eappen explains that the Quebec Freedom Network advocates smaller government, lower taxes, less government spending and more personal freedom. These goals are similar to the goals of those who profess the libertarian philosophy. The six founders of the Quebec Freedom Network each contributed $500. into a fund and this money was used to launch the venture. The Quebec Freedom Network has plans to host its first Conference at Saint-Foy, Quebec at the Hotel des Gouverneurs on October 23, 2010. Some people are referring to the Quebec Freedom Network as a northern “Tea Party.” Though the Quebec Freedom Network admits to similar goals as the Tea Party Movement in the United States where ordinary Americans are as mad as hell and they are not taking it anymore, they (the Quebec Freedom Network) is intent on defining itself on its own terms. The Tea Party movement has become a major voice in the American, political landscape and is playing a significant role in choosing non-establishment candidates rather than career candidates for the fall 2010 elections. Even though the Quebec Freedom Network does not wish to be called a “Tea Party,” it is likely to attract those ordinary Quebecers who are likewise “as mad a hell and are not taking it anymore.” One wonders if the elite, rank and file Liberals, Conservatives and Parti Quebecois along with the mainstream media make a concerted effort to delegitimize the Quebec Freedom Network by referring to their followers as crackpots, lunatics and morons? This has happened with Tea Party followers in the United States. The good news is the Quebec Freedom Network seeks to move beyond the distracting, pretend debate of “Yes” versus “No” in regards to the so-defined question of separatism or federalism. I commend the Quebec Freedom Network for that particular good news item and I implore the leadership to directly address the issue of monetary reform by making an effort to expose the lies, deceit and deception and promote truth, honesty and integrity in matters relating to our orthodox, economic system of usury-based, debt money. Such research can be commenced at the website for UsuryFree Living http://www.usuryfreeliving.net as there are plenty of links to relevant information in their Blogroll. I invite the leadership team of the Quebec Freedom Network and their supporters to commence their self-imposed research and study of those aspects of our orthodox, economic system of usury-based, debt money that formal education neglected to teach them - namely that the design flaw of usury is the killer machine that keeps debtors (individuals, families, businesses, municipalities, provinces, and countries) in debt for generation after generation. Hopefully, the Quebec Freedom Network will recognize the need for monetary reform and embrace the usuryfree community currency movement with a goal to encourage Quebec politicians at all levels of government to take immediate action to create a usuryfree lifestyle for everyone living in the province of Quebec. Quebec has the potential to become the poster-province for usuryfree living in Canada with a little nudging from the Quebec Freedom Network. Does the Whistle Pull The Train? The simple answer is absolutely, the whistle does NOT pull the train. For far too long, we-the-people have been permitting the whistle (the noise-making politicians at all levels of government who are commonly controlled by a shadow government) pull our train. Many people are awakening to the simple fact, that modern government (no matter what level - municipal, provincial/state or federal) is not a friend of we-the-people. Why has the whistle been pulling our train? Are the New World Order advocates the real shadow government behind our politicians? Many of we-the-people are now realizing that this is the most likely scenario. The key question is: What are we-the-people going to do about it? It is really we-the-people who should be pulling our train. It is time for we-the-people to make a determined effort to fully awaken to their (the New World Order) agenda and reform ourselves so that indeed, we can pull our train again. Where do we start? Why are we-the-people accepting to live the illusion and set aside reason? Why are we-the-people so brainwashed to believe that we cannot do anything about our controllers who are stealing our wealth and resources? Why are we-the-people not rebuking those who are feeding us lies, deceit and deception? Why are we-the-people not restraining those who are implementing harmful policies? Why are we-the-people permitting self-styled authorities to instill a fear of openly speaking the truth about critical issues within the Court of Public Review? Why are truth-seekers not commonly respected by neither the masses of we-the-people nor the noise-making politicians nor the mainstream media? For example, even though millions of we-the-people now know that 911 was an inside job and that the noise-making politicians in cahoots with the electronic and print media lied about what really happened on September 11, 2001, most people are still afraid to talk about the truth when they are in public venues. Millions more of we-the-people know that banks (a) never lend out depositors’ funds and (b) never create the interest or usury portion of any loan, but most debtors keep signing promissory notes which are really impossible contracts. Why is it seemingly more dangerous for we-the-people to practice honesty and integrity and seek and teach truth, than to enter a dynamite storage area with a lighted match? Could it be that the mass consciousness of we-the-people is being raised by countless individuals who are experiencing overwhelming evidence of massive manipulation and human engineering by the shadow government behind the noise-making politicians? As individuals, each one of us who make up the larger group of we-the-people are now facing a dilemma? Do we take action and do our part to expose the lies, deceit and deception while fostering honesty, integrity and truth or do we just complain in our inter-connecting private circles of family, friends, neighbours and working colleagues? I recommend that we-the-people set aside our fears and take action now as active truth advocates as we progress into this 21st Century. Otherwise, the already awful conditions will only worsen and the mainstream print and electronic media will continue to bombard us with fear every day as part of their selfish agenda of problem, reaction, solution which is ultimately designed to financially enslave us with Big Brother's invasive and plasticised, electronic, usury-based, money system - devoid of paper notes of federal cash. Up until now, great numbers of we-the-people have been seeking instant gratification through arts and entertainment as a shield to guarantee us some relief from usury payments, taxes and others unpleasant aspects of our mundane world of reality where we constantly wallow in poverty, scarcity and lack while watching or hearing about wars and violence elsewhere on this planet. Smaller numbers of we-the-people, but still significant numbers, attend religious services at their church-of-choice in search of an insurance policy of a heavenly life hereafter. Yet others seek refuge and escapism from the financial and social chaos or otherwsie in alcohol or drugs. It is time for we-the-people to know that our compliance with the status quo and our inactivity is selfish and self-serving and is simply compounding the problems and not offering any solutions. Indeed, it is time for we-the-people to take action based upon the preponderance of evidence that is now available - thanks to their (the New World Order elites) world wide web. To begin to pull our won train again, each individual within the larger group of we-the-people must re-examine who each of us really is. How about some silent meditation each day? Try to shut out not only the noise-making politicians but also, the noise of daily life and make an effort to reflect upon those things that each of us really believes in and why we have those beliefs. Now that we-the-people fully understand that it is ourselves who are really pulling our train, we will most likely become motivated to action. A good starting point is to visit the website UsuryFree Living http://www.usuryfreeliving.net When the usury-based, debt money system is fixed, it will be much easier to fix any other social problems. Read what is there, watch the video clips and help usuryfree creatives to promote the forthcoming Sixth Annual UsuryFree Week from November 13th to 19th, 2010. Then click on the links in the Blogroll for plenty of relevant background information. You will learn lots that formal education neglects to teach. Know that this is only the beginning of your re-education process whereby you will first have to unlearn lots of the lies, deceit and deception that has been foisted upon you either knowingly or unknowingly by the authorities in the system which you formerly trusted. Your new self-imposed mission is to unlearn, then learn or re-educate yourself and then teach others, thereby multiplying and duplicating your efforts. Simply by telling others that the whistle does not pull the train will make a big difference on whether enough of us awaken fast enough to save ourselves as a planet currently headed towards self-destruction. Welcome aboard! You are now pulling the train! It is re-assuring to find usuryfree creatives who are likewise writing about the evil and immoral effects of the design flaw of usury. Like most people, I grew up within the modern money system. The lessons were easy to learn. Save money, open a bank account and receive INTEREST! And when I grew up and really wanted to have fun, I could invest in the STOCK MARKET and reap dividends - interest upon the money invested. As an engineer, I was taught to calculate the time value of money, and the income tax ramifications of depreciation. What a surprise I had when I discovered that everything I was taught was WRONG. _Psal 15:5_ He that putteth not out his money to usury, nor taketh reward against the innocent. He that doeth these things shall never be moved. _Ezek 18:13_ Hath given forth upon usury, and hath taken increase: shall he then live? he shall not live: he hath done all these abominations; he shall surely die; his blood shall be upon him. _Exod 22:25_ If thou lend money to any of my people that is poor by thee, thou shalt not be to him as an usurer, neither shalt thou lay upon him usury. _Levi 25:36_ Take thou no usury of him, or increase: but fear thy God; that thy brother may live with thee. Thou shalt not give him thy money upon usury, nor lend him thy victuals for increase. To examine one´s own beliefs and understandings is one thing, to find fault in them is another - and most embarrassing. Why is that? I have had to realign my own thoughts when confronting modern money and banking processes. I was taught and sincerely believed that we should save money in banks or invest our capital in stocks and, in return, gain interest, or dividends. The explanation was so simple: Hoarded money is not available to be exchanged, thus is not good for the economy. But recently, I pondered the fact that while it is good not to leave surplus money "buried in the backyard," it is even worse to expect usury for loaning it to a bank or investing it in a business. I shocked myself when I realized that my lifelong programming distracted me from the truth: any fee or charge denominated in money for the investing of money is usury - an abomination and, in the long run, impossible to pay! Yes, indeed, we all have been programmed to accept usury as good. No matter how much or how little return on investment is involved, to charge a fee, in money, for the use of money, is usury - plain and simple. But we´re told that modern man needs interest and dividends. It´s great to have an annuity. We fuss and calculate future worth for present value invested, and utilize compound interest formulas. We estimate what our retirement accounts will profit us. Why bother saving if one couldn´t get more money in return? If there is no reward, why would one loan or invest with his neighbor? I asked my imaginary friend from 4,212 B.C. that very question: What did the rich herdsman do with surplus capital and/or investment? My friend leaned on his shepherd´s crook and thought a moment. He said, "If the herdsman was rich in herd beasts but shy on grazing land, he might invest them, via a loan, to his neighbor with more land and no herd beasts. In return for that investment, the owner and the borrower agreed to divide the gain, the newborn animals. And after a period of time, the original capital, the breeding stock, would be returned, well fed and well bred." In the ancient way of doing business, the common sense folks knew that life did grow and reproduce. The natural increase of plants, animals, and living things was well understood. Seeds produced plants that generated more seeds, thus multiplying amounts, and higher value. Animals bred more animals that increased the quantity and value. But precious metal coins, or even paper currency notes are dead dead dead. They can´t naturally increase. You can´t plant gold coins and get a bumper harvest of more gold coins. The scam of the usurers was to persuade their victims that the rate of return of nature, natural increase, could be applied to money, a dead dead dead thing. So why is usury on dead money so immoral, or bad? Usury requires the borrower to pay back more money than he received. If you have a fixed amount of precious coin money in circulation, then usury drains money out of circulation. Worse, it transfers money power to the lender, for nothing more than extending credit. Some economists would argue that the "velocity of money" gets around the finite money problem. But the velocity of money will only work in a labor intensive marketplace. A simple example is a world with three workers with each worker owning one money unit. Each day, they hire each other to do work. At the end of one year, 3 man years of work is performed with only 3 units in circulation. But this fails when investment or mass production is involved. Any businessman puts money into the marketplace to hire labor and pay for raw materials. And he offers his product or service to this same marketplace to recoup not only his labor and material cost, but his profit, as well. If you stretch the test case to the limit, where everybody is a "producer" demanding profit from a finite money pool, the obvious conclusion is there isn´t enough money to repay labor, material AND profit. Which results in a shakeout of marginally profitable businesses - just because money was scarce. Usury, like business investment, demands the money pool grow to cover the drain of "interest." If there is no way for the borrowers to "create" new money to pay the usury fee, the system will produce a portion of losers, who will be foreclosed or repossessed by the creditor. Examine the friendly poker game where each player gets 100 chips from the host. But the host requests that you pay him 101 chips at the end of the night, in gratitude for using his chips. And if you fail, you pledge something of value for default. As the night wears on, some win, some lose. But as the end of the night arrives, there will certainly be folks who not only cannot pay the gratuity, the interest, the usury, but can´t even repay the original capital. The defaulter then forfeits his property to pay back the capital and interest. And worse, he blames himself for his failures instead of the real culprit - usury! Usury is despicable for it not only is impossible to pay, in a finite money system, but the usurer wants the victim to be grateful that he is allowed to grow back his skin - after being skinned alive! In a universal sense, usury eventually robs everyone else in the system for the benefit of the usurer. Usury boosts prices, raises costs, and robs the consumer and producer for the benefit of the parasite. Don´t misunderstand me. I´m not saying that we shouldn´t invest our surplus. 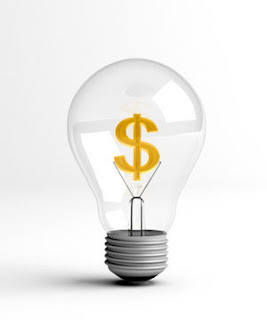 Investment can and should return something of value, such as the gain or profit from the enterprise. But to require more money in return for the loan of money is not virtuous, moral, or even sane. In our modern times, the total outstanding debt, public or private, due from usury is impossible to repay. If tomorrow, all debts were due, there is not enough real money in the whole world to pay the outstanding debt. Which would mean that all the property pledged for the debt would fall into the possession of the banksters who loaned the credit into existence (and charged interest!). The "Western Democratic" Economic System is based on Usury and Piracy! Like fish who can´t perceive their water universe until they leave it, our understanding of the economic harm is impaired until we leave usury. 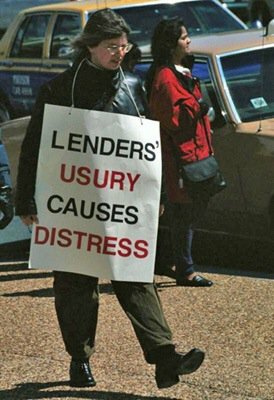 Usury damages the economy because it steals value from the seller and buyer, for the benefit of the usurer. The usurer preys upon those in need, the merchants and producers, starved of capital. They who prey upon merchants and productive people are called pirates. In other words, usury and piracy are closely related if not synonymous. There is no need to revolt with violence - non-cooperation is the key. If Americans revolted against the banking and investing institutions, by canceling all interest bearing accounts, that would drive them to find other victims. If the people revolted against Social Security, and revoked their signatures on the application for the number, the voluntary servitude system would collapse. If we left behind the "Babylonian" money lenders, the result would be lower prices with higher profit margins. And more money, debt free, means more exchange of goods and services. And that spells prosperity. Shucks, even the Bible says so! The future is dim, if we remain in the banker´s grip. There is no future but decline as we are bled dry by the usurers. What can we do about parasites? If usury is akin to sucking leeches, there is but few alternatives. C) we can cure the parasite infestation by complete excission. Either they leave us alone or we leave them alone - permanently.